Conversion Gel is a white gel that enables any surface to have portals placed on them, even if they are not normally portal-conductive. If it is washed off, the portal will sit unchanged where the gel used to be, except at the end where it is removed in attempt to prevent an exploit onto overhead areas. However, if Chell spams portals at the high platform, it will, as mentioned above, sit unaltered. According to Cave Johnson, Conversion Gel is made from ground-up moon rocks, which make a great portal conductor. 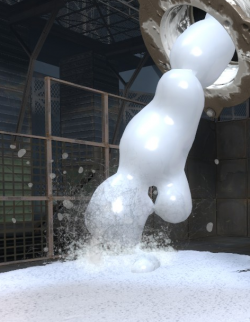 This is shown when Chell fires a portal at the moon near the end of the game, despite the non-flat surface of the moon. Unfortunately, long-term exposure to ground up moon rocks led to Johnson's poisoning and eventual presumed death. He attempted to fashion a cure by forging a gel out of the rocks, in hopes that "jumping in and out of these new portals can somehow [...] leech the lunar poison out of a man's bloodstream." Surfaces that are not flat or big enough to fit a portal will not be portal-conductive even when coated in Conversion Gel. This means that Conversion Gel-covered Weighted Storage Cubes will not function as a portal-able surface. This page was last modified on 18 August 2018, at 21:31.